This morning when I went out to do chores I noticed something wasn’t right. As my chickens were jumping all over me in hopes of some food, one of my gals was off in the corner not even looking my way. Oh no, I thought…I have a sick hen. It always breaks my heart to find a sick animal and I knew I had to get her out of there right away. Hens can be unintentionally cruel. I have seen my gals hen peck a sick chicken in order to keep her away from the flock. Luckily they had yet to pay her any attention, so I had a little time to get her out and give her some care. As a homesteader, it is my job to keep all my animals safe not only from predators but from each other as well. 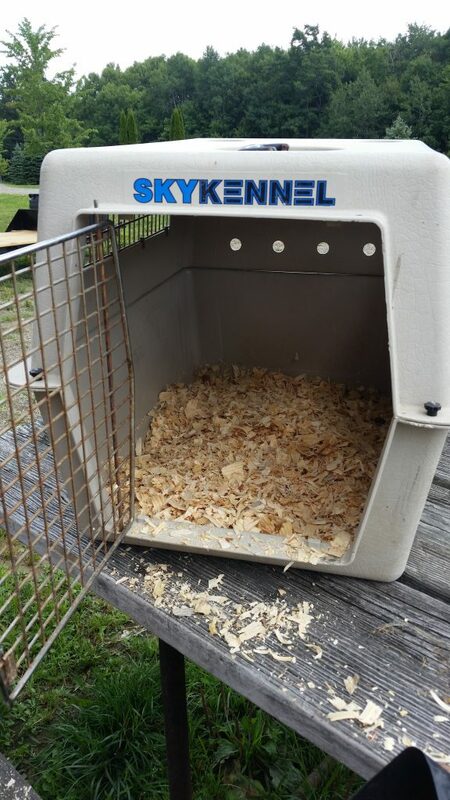 I headed off to the barn to get the recovery crate all ready for a new patient. When you have chickens it is important to keep them as healthy as possible. 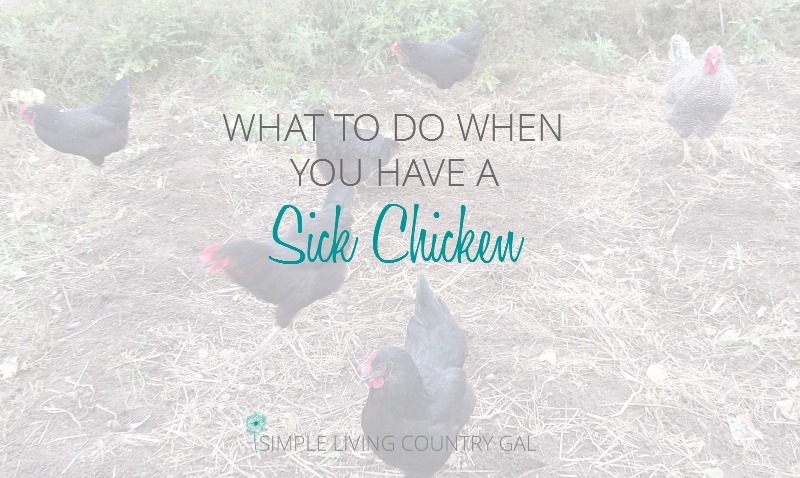 One sick chicken that is unattended can quickly result in a flock of ill birds.Having a safe place to put your chicken will help you to evaluate her more effectively. Also, the solitude and quiet of a recovery crate can be just what the doctor ordered. Rest and calm can help speed up the healing process of your bird. 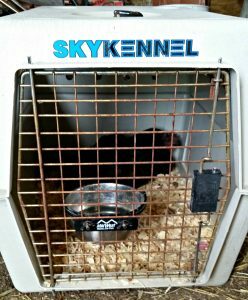 For my recovery pen, I use a small pet crate. I see these at yard sales quite often, if you are out and see one I suggest you grab it. It is better to have something ready than find yourself in a situation unprepared. I lined our crate with fresh wood shavings but you could also use straw. I have a small bowl for water that I can attach to the door so it is off of the ground. They sell these bowls at any pet store like this one. This keeps the water clean and free from debris. I gently placed my patient inside her new digs and found a quiet corner of the barn. I usually only feed my sick hens twice a day. Knowing exactly how much food she is eating will help me evaluate how ill she is. If an animal is not eating, that animal is in trouble. I watched her closely for the rest of the day and noticed she was no longer in distress. I decided to give her the night and see how she was in the morning. It is important to know when you need a vet’s assistance, in most cases, a call is free so do not hesitate if you are unsure. The next morning she was doing much better but I kept her in the crate another day to be sure. A few more days of TLC and she was well enough to go back in with the flock. Since my hens are all Black Stars I tied a piece of yarn around her leg so I could easily pick her out. Sometimes if a hen is kept out of the flock for a long period of time, henpecking may occur when she reenters the flock. Just be aware of this and watch her for a few days for any signs. If you have a holding pen inside your coop, you can use that as well. I kept our patient in our holding pen only at night. She was then put back in the coup a few days later. Remember it is important to be proactive in your animal’s overall health. Catch sicknesses early to keep your flock as healthy as they can be. As of today’s date, my patient is recovered and back with her peeps, crisis averted!